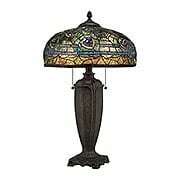 Shop art glass lamps, pendants, chandeliers and flush mounts. 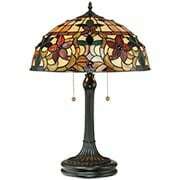 With a nod to circa 1900 art nouveau style, the Weston Table Lamp is sure to enliven any space. 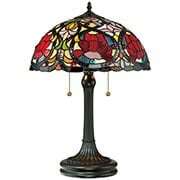 The floral shade is made up of 282 pieces of art glass using the copper foil technique developed by Louis Comfort Tiffany himself. 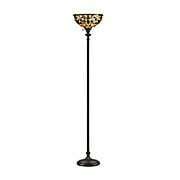 An unadorned, yet elegant base features a rich bronze finish, showcasing its intricate details. 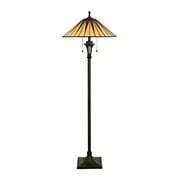 The classic dragon fly, which catapulted Luis Comfort Tiffany to fame, comes to life in this impressive table lamp. 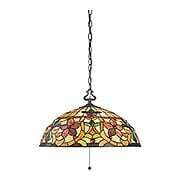 With incredible attention to detail, it features hand assembled pieces of art glass in green, yellow and red hues. 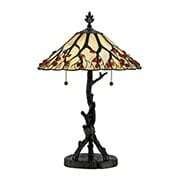 The intricate base, resembling a tree trunk and finished in rich bronze, is anchored with even more dragon flies. This Art Nouveau inspired style adds colorful beauty to any room. The Alcott Floor Lamp is Mission styling at its finest. Its beautiful shade is artfully arranged in geometric shapes and features a soft green striped accent. The details are enhanced by an unadorned, yet shapely base finished in valiant bronze. 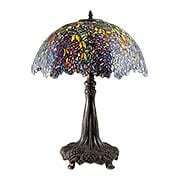 Authentically reproduced from a circa 1900 Tiffany original, the Laburnum Table Lamp is truly stunning. A profusion of cascading wisteria blossoms forms its shade in vibrant colors of yellow and red, nestled within a range of soft pinks and lavender. Made up of nearly 2,000 pieces of hand-cut art glass, each is assembled using the copper foil method developed by Louis Comfort Tiffany himself. Just like the originals, the detailed footed base resembles a tree trunk finished in a rich, bronze patina - adding to its organic nature. 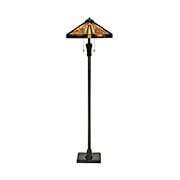 Whether lit or unlit, you'll enjoy the breathtaking elegance of this museum-quality showpiece. 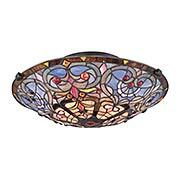 Tiffany Studio's fabulous stained glass inspired this lovely Victorian style flush mount. The classic floral pattern shade is hand-crafted from genuine art glass in shades of yellow, orange and cream, accented with amber flowers and green leaves. Set into a delicate, bronze finished framework, the effect is magical. The classic dragonfly motif catapulted Luis Comfort Tiffany to fame. 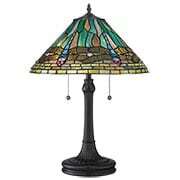 This perfectly reproduced lamp features a layered brick rim with blue dragonflies on a background of greens, browns, and ambers. With incredible attention to detail, it's hand assembled out of 318 pieces of art glass carried on a 24" classic base of vintage bronze. Graceful Dogwood Blossoms take center stage on the elegant shade of the Grove Park Floor Lamp. 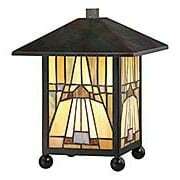 Handcrafted from genuine art glass, this Arts & Crafts design blends hues of amber wine, steel blue and hunter green. 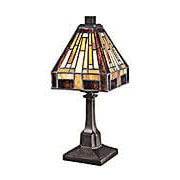 Made up of hand-cut art glass, each is assembled using the copper foil method developed by Louis Comfort Tiffany himself. 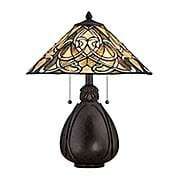 Its stately, red-oak base features a geometric design with wrought-iron accents. 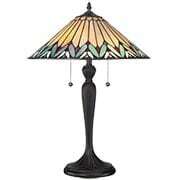 Tiffany Studio's fabulous stained glass inspired this lovely Victorian-style table lamp. The classic floral pattern shade is hand-crafted from genuine art glass in shades of yellow, orange and cream, accented with amber flowers and green leaves. Set into a delicate, bronze finished framework, the effect is magical. Tiffany Studio's fabulous stained glass inspired this lovely Victorian style torchiere. 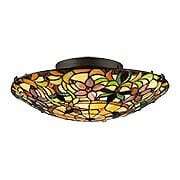 The classic floral pattern shade is hand-crafted from genuine art glass in shades of yellow, orange and cream, accented with amber flowers and green leaves. Set into a delicate, bronze finished framework, the effect is magical. The vibrant Larissa floor lamp casts soft light and harmonious design into any Victorian interior. 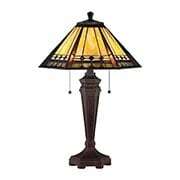 The shade's jewels, pastel tones, and 426 art glass pieces are accented by the vintage bronze finish of the base. The vibrant Larissa table lamp casts soft light and harmonious design into any Victorian interior. 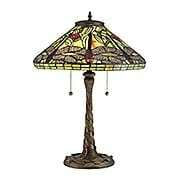 The shade's jewels, pastel tones, and 426 art glass pieces are accented by the vintage bronze finish of the base. Bold and geometric, this striking art glass floor lamp recalls Frank Lloyd Wright's Prairie glass panels of the early 20th century. 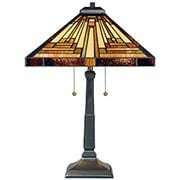 A classic Arts & Crafts piece with handcrafted art glass in warm shades of amber, bisque and earthy green. What a dramatic accent to any vintage or contemporary interior! 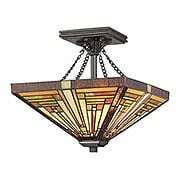 The Arden Collection features hexagonal shades filled with richly hued stained glass. 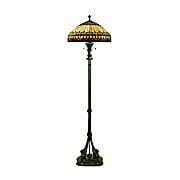 Blending olive, gold, burgandy and carmel, this classic floor lamp is a perfect companion to early 20th century style interiors. 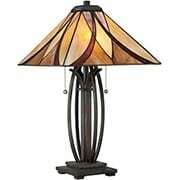 The Arden Collection features hexagonal shades filled with richly hued stained glass. Blending olive, gold, burgandy and carmel, this classic desk lamp is a perfect companion to early 20th century style interiors. Paying homage to the Art Nouveau era of the turn of the 20th century, the Pomez Floor Lamp offers a new twist on traditional Tiffany materials. Its eye-catching shade steals the show with vibrantly colored agate stones in graduated hues of red and yellow, creating a warm, relaxing glow. Each stone is hand selected for quality, tumbled for a smooth, polished look, and then carefully placed to achieve the most dramatic effect. 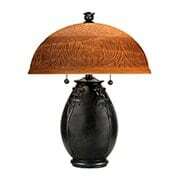 Paired with an elegantly carved base, finished in burnt cinnamon, the affect is striking.